With the Ogre Designer’s Edition now past $550,00 in funding on Kickstarter and seemingly going to include everything but the kitchen sink it might be worth taking a look back at Ogre‘s past for a bit of perspective. Ogre and expansions circa 1984 and 2000. The original 1977 Ogre release was in a plastic bag. Later this was updated to a ziplock bag and then to an 80’s Steve Jackson Games’ favorite, the plastic ‘Pocket Box’. In the photo, the Ogre and G.E.V. pocket boxes are circa 1984 and the ziplock bags are from the late 80’s and 2000 release. When looking at the new Ogre Designer’s Edition it is worth noting this is what Ogre has always been. Except for the miniatures, Ogre has always been a small, cheap release. It never had mounted maps or counters nor full color rules. Perhaps the closest Ogre got to a deluxe treatment was…well…Ogre Deluxe published in 1987. It was just Ogre but it had a heavy cardstock map and standup counters that fit into plastic stands. This was the flashiest Ogre yet. Contents of the 2000 Ogre/G.E.V. re-release. Both games in one box. In 2000 Steve Jackson Games re-released Ogre and its expansions. For the first time since 1982 Ogre and G.E.V. were combined into one box (literally a plastic VHS tape box). The components were basically the same as earlier releases. It contained the same counters and you had to cut the maps apart because they were printed on the same sheet. The rules were in one book and it had Ogre on one side and when flipped over it had G.E.V. on the other. Now maybe one can understand why many older gamers want the classic counters in 1″ mounted format. For decades all we have had is cardstock, cut-apart-yourself, 5/8″ counters. The counter art was always great — in fact it is now classic — it was just the physical quality that was lacking. A sneeze or slight breeze from any open window could wreak havoc upon a game as counters scattered on the wind — Although admittedly a great lesson in G.E.V. physics! 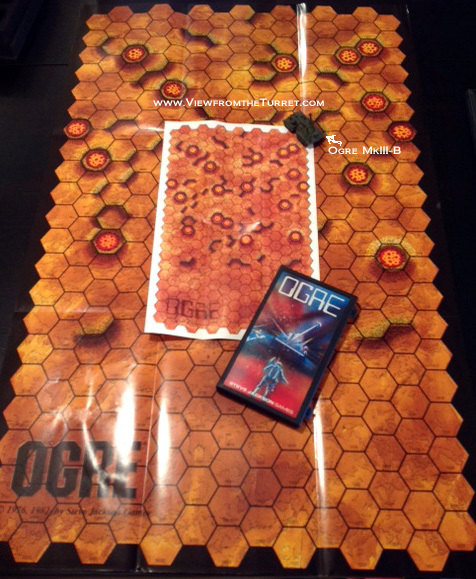 Here we see the original Ogre box and map on top of the Deluxe Ogre map with 1.5″ hexes. At the upper right of the original Ogre map is a Deluxe Ogre MkIII miniature. 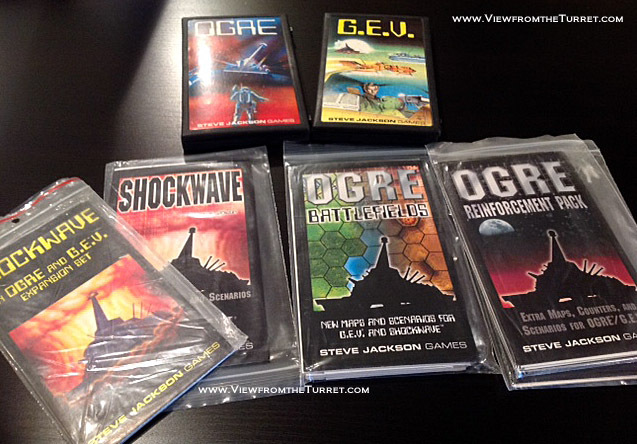 2000 also saw the release of Deluxe Ogre and Deluxe G.E.V. that combined the boardgame rules with the miniatures. None of the expansions or new maps were ever released in the Deluxe format. 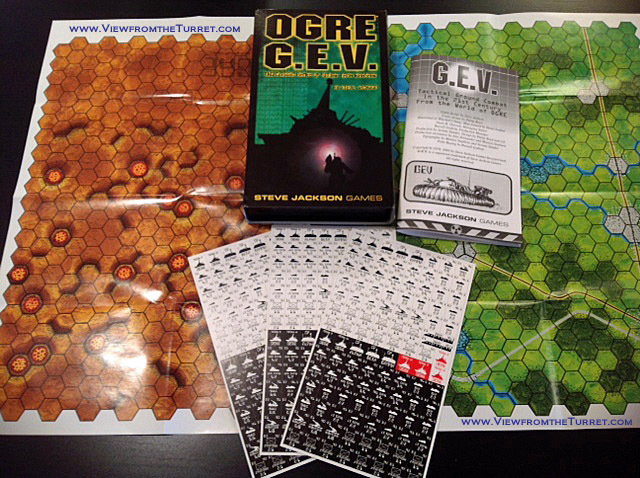 The Deluxe version delivered huge 1.5″ hex Ogre/G.E.V. maps and lead minis. Of course not all boardgamers appreciate minis and the lack of bases with stats made the game a tad fiddly. You needed an off-board sheet or cards for all your unit stats and some sort of marker for Disabled status. Veteran gamers were once again denied mounted counters. These maps are essentially the same maps we will see in the Ogre Designer’s Edition but they will now be mounted. We will also get the new ~1.25″ mounted hex-shaped counters. Perhaps best of all, at long last, all of the counters will be available in the classic style in 1″ mounted format as an extra purchase! The Ogre Book 2ed and Ogre Scenario Book 1 from 2000 and 2001. Again, an Ogre MkIII miniature in the middle. 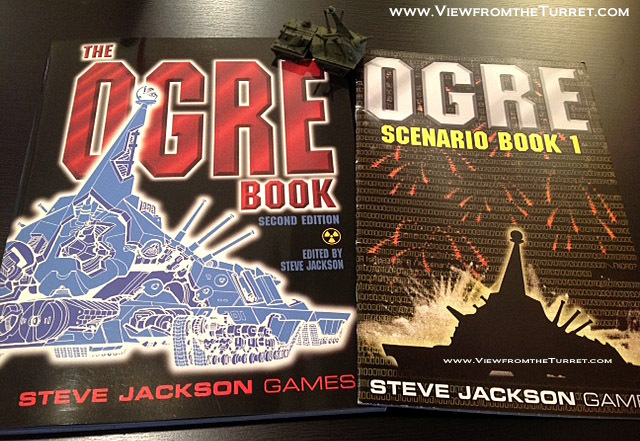 In 1982 Steve Jackson Games released the Ogre Book. It was one of the first of its kind. It was a book dedicated to Ogre and G.E.V. that covered the development of the game along with history, fiction, expansions, and strategy. Much of it came from articles previously published in The Space Gamer magazine but having it all combined in one spot was wonderful. It is probably worth mentioning that 1982 was long before the Internet and printed books and magazines were the only ways to get information on games. When Steve Jackson talks about getting letters from gamers he means actual handwritten, sent-with-a-stamp letters! In 2000 SJ Games released the Ogre Book Second Edition now updated with new info and a few new articles. In 2001 we got the Ogre Scenario Book 1 (so far no Book 2) that provided seven new scenarios. So as you gaze upon the ~15lb wonder that is Ogre Designer’s Edition it is worth taking a moment to reflect on how far the game has come since its humble beginnings. Ogre is BACK baby! Also see Ogre Designer’s Edition. This entry was posted in Board Wargames, Miniature Wargames, News and Updates, Ogre, Sci-Fi. You missed a version. There was Orge Deluxe. It was just the Orge game with stands for all the counters and a super sized map. This is different from Deluxe Orge in that there were no “minitures” in it. The page map you show above right is the same map that that came with this version. You are right. I remember seeing it in the stores but never owned or saw an opened copy. I remember the plastic stands. I’ve dug around the Web a bit but can’t find any images or solid details on it. BBG says it was published in 1986, which sounds about right, but says it had a mounted board. You remember more details? It was just Ogre correct not G.E.V.? Oh wait, BGG does have some photos as I remember the game so I’m pretty sure that is it. I updated the post. Thanks!